Published Nov 1981 by Marvel. This item is not in stock. If you use the "Add to want list" tab to add this issue to your want list, we will email you when it becomes available. Volume 1 - 1st printing. "His Greatest Team-Up Battles!" 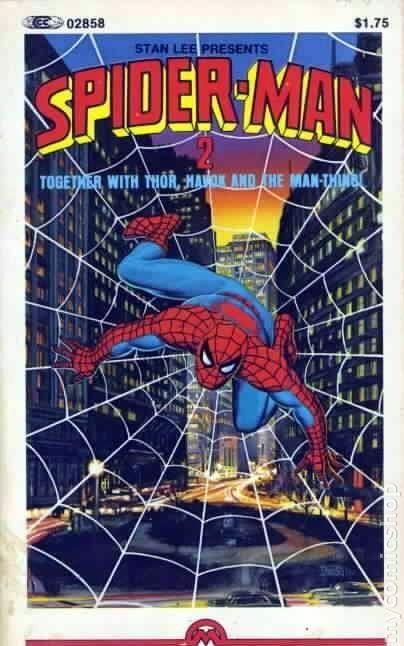 Collects Amazing Spider-Man (1963-1998 1st Series) #71, Annual #2, and Marvel Team-Up (1972-1985 1st Series) #27. Written by Stan Lee and Len Wein. Art by John Romita, Sr., Jim Mooney, and Steve Ditko. Cover by Bob Larkin. 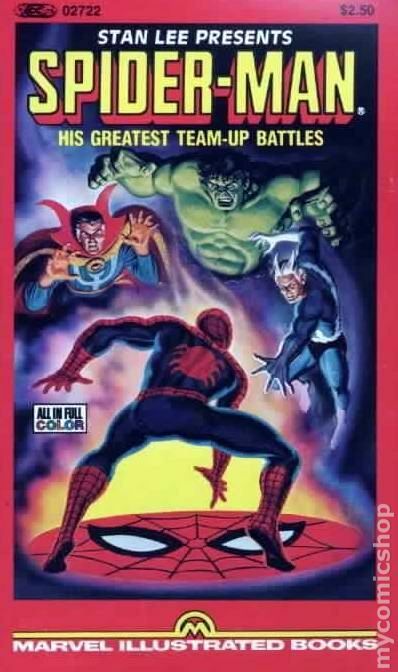 Spider-Man battles against and alongside the super fast Quicksilver, the Incredible Hulk, and Doctor Strange, Master of the mystic Arts. Softcover, 4-in. x 7-in., 160 pages, full color. Cover price $2.50. Published Oct 1982 by Marvel. Volume 2 - 1st printing. "Together with Thor, Havok,and the Man-Thing!" Collects Marvel Team-Up (1972-1985 1st Series) #68-70. Written by Chris Claremont, Art by John Byrne, Tony DeZunigia and Bob Wiacek. Your friendly neighborhood Spider-Man teams up with the Mighty Thor, the mutant hero Havok, and the macabre Man-Thing in three exciting tales of Mighty Marvel Adventure! Softcover, 4-in. x 7-in., 160 pages, full color. Cover price $1.75.